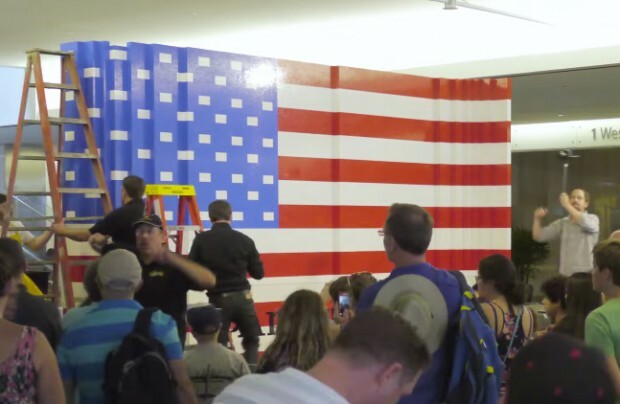 The past week, more than 15,000 visitors at the National Museum of American History helped build the world’s largest LEGO United States flag. It’s made of over 100,000 bricks and measures 9.5ft x 14ft. LEGO employees Dan and Chris Steininger designed the impressive collaborative artwork. They came up with a simple pattern so that even kids and LEGO newbies could help put it together. Congrats everyone! Now blow it up with fireworks! Just kidding. The massive flag was actually made not for Independence Day but to celebrate the museum’s newly opened Innovation Wing. ABC News has more about the flag’s construction.